Nestled in vaulted cellars of The Ampersand Hotel, just along from the V&A Museum in Kensington, Apero is an all day neighbourhood brasserie specialising in Mediterranean zest. 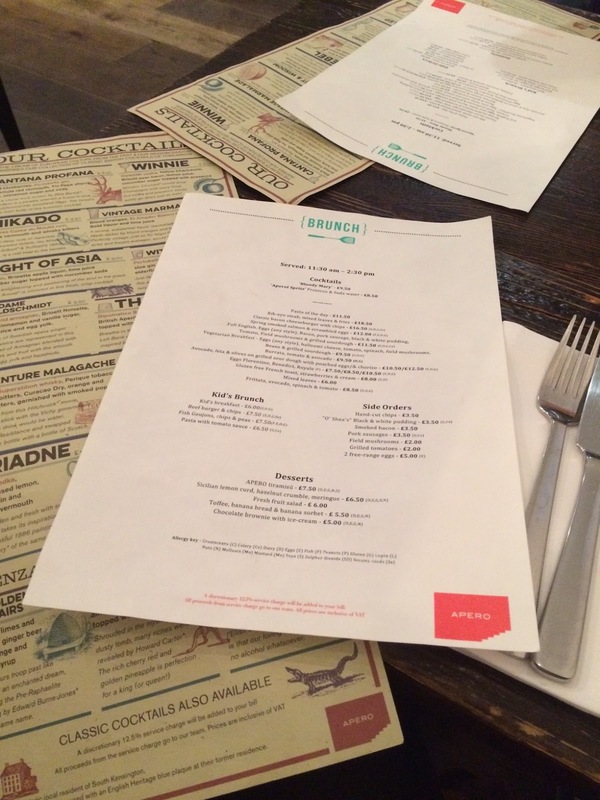 With a menu composed of fresh, seasonal produce sourced from local suppliers, I was very happy to visit one Sunday morning with my friend Elspeth to trial out their infamous brunch menu…. With everything from Rib-eye Steak and fries, to more traditional brunch Frittatas and Eggs Florentine, the menu certainly offered something for everyone! Never unable to resist an egg white omelette, when I spotted this option on the menu, served with smoked salmon, tomatoes and spinach, my decision was made! Going for the egg option also, Elspeth decided on the Avocado, feta & olives on grilled sour dough, served with poached eggs and the choice to add chorizo. Choice to add chorizo? What non-vegi would be crazy enough to turn that down?! Having said that, she was brought what was certainly a very generous portion, but seemingly it was so tasty there was no trouble finishing it all! Taking away our plates, the waiter asked if we’d like to see the desert menu. Despite being pleasantly full from our mains, he managed to convince us just to take a look and see if there was anything we fancied. Turns out, we didn’t take much persuasion! With options including tiramisú, lemon meringue and chocolate brownies, we’d have been crazy to say no…. or, at least, that was our excuse! After the waiter promised us they were just a small portion, we decided we could manage a taste of the toffee banana bread and banana sorbet. And, same as we were ordering deserts, we might as well go for the fresh fruit salad too! Well, the slab of banana bread that soon arrived in-front of us was certainly not a small portion…. but turns out we were very glad, as it was absolutely delicious! Moist, flavoursome, but not too sweet, it was perfectly complimented by the sticky toffee sauce and cool banana sorbet. Naughty indulgence? Perhaps. Totally worth it? Absolutely! Even the fruit salad, a nutritious mix of pineapple, pear, apple, strawberries, blackberries and blueberries, felt just as indulgent as it did healthy. Fresh, crisp and deliciously refreshing! With brunch options ranging from £7.50 (for the eggs florentine) to £18.50 (for the rib-eye steak), and deserts averaging around £5, Apero is perhaps slightly leaning to the high end price points, but certainly worth it. 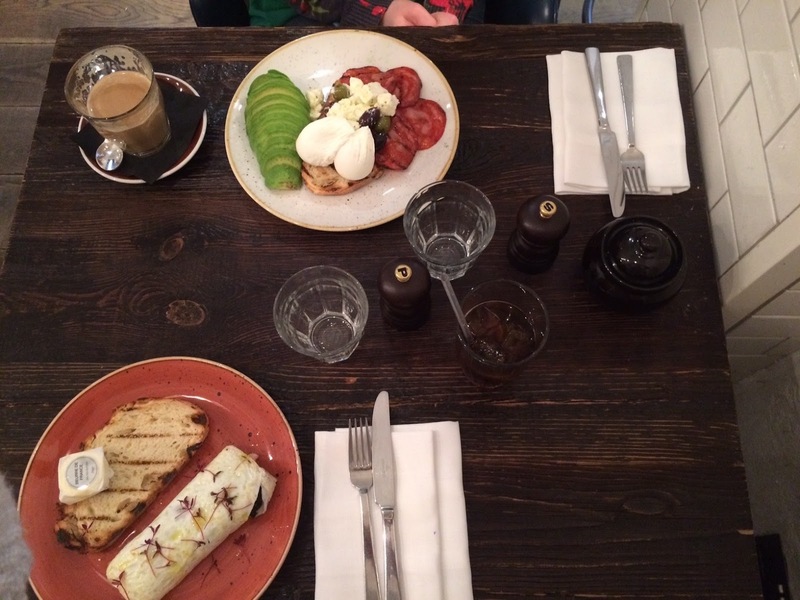 With leather snugs, Spanish tiled floors and exposed bricks providing an almost Scadi style feel, coupled with prompt and friendly service, alongside fantastic food, it's a brunch you most definitely should experience! Furthermore, with an impressive cocktail list, including signatures such as The Rebel or Cantana Profrana, a private hire wine room, and the ever so popular sharing menus comprising of Mediterranean style bites, Apero is equally as popular in the evenings…. and I can certainly imagine why!